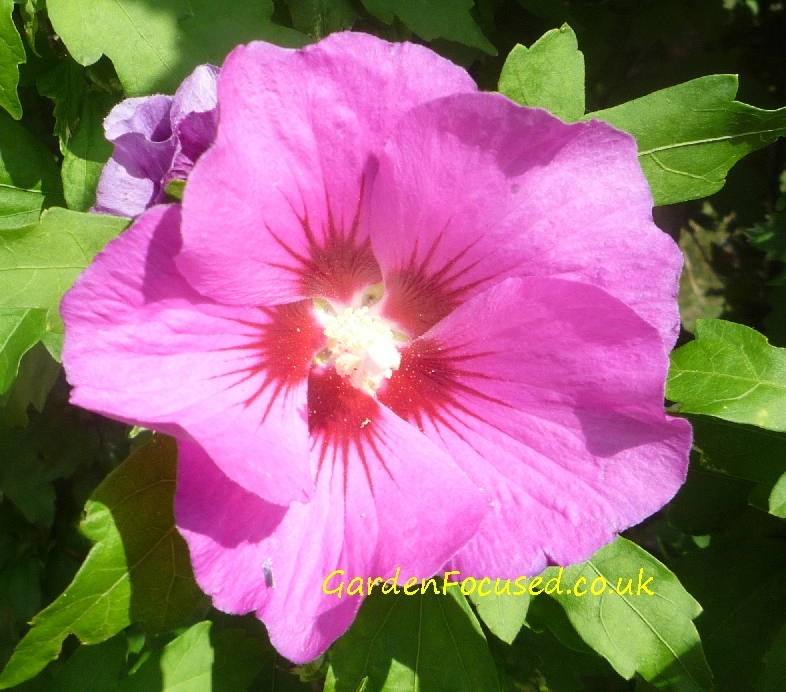 Hibiscus syriacus, also known as Rose of Sharon and in the UK rose mallow, grows to about 3.5m / 11ft high and 2.5m / 7ft wide which makes it unsuitable for very small gardens but ideal for medium and larger sized plots. When grown in the correct position it will look after itself with no attention whatsoever but it does appreciate some pruning after it has flowered not only to keep it to the required size but also to encourage the best flowers in the next year. Hibiscus syriacus is the national flower of South Korea it appears on several of their national emblems including banknotes and the seal of the president. Its origins are key to the conditions in which it grows best. Full sun is needed when grown in the UK, soil conditions are far less important. It will grow well on clay through to light soils although water-logged conditions are definitely not good for this shrub. When established it is fully frost hardy in all parts of the UK and quite capable of withstanding very frozen temperatures throughout the winter. 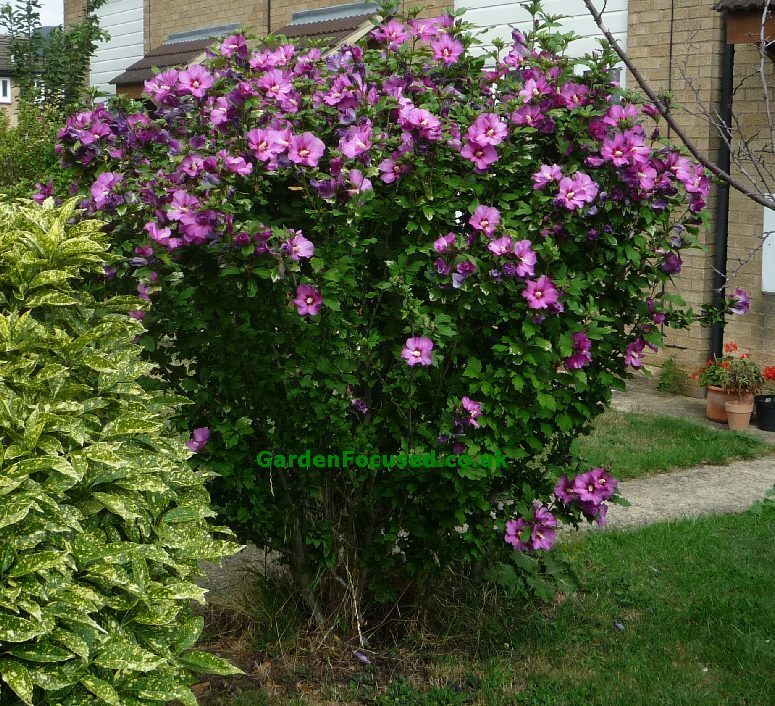 All varieties of hibiscus syriacus flower late in the season, typically throughout August, and the flowering period lasts for about three weeks, slightly longer if the weather is warm and dry. If you look carefully at the plant during this time it becomes clear that individual flowers last only a couple of days but so many are produced during the flowering season that the plant appears to be covered in colour all the time. In its natural state this shrub is multi-stemmed (see the picture below) and the stems grow from ground level. It is most definitely an upright shrub as the picture above shows and requires no training, other than a once a year prune, to retain this shape. If left un-pruned the outer branches will start to droop outwards under the weight of the foliage. The flowers of original varieties are rose-pink with a darker inner circle, very attractive by any standards. In the 1960s, right up to the present day, the plant breeders have produced a large number of new varieties with flowers ranging from pure white, blue and a range of colours in between. Semi-double flowers are the most recent additions and some varieties are shorter and more compact. As well as being a late-flowering shrub, hibiscus syriacus is also late to produce foliage, typically it starts to appear in mid-May. The leaves are dark green, about 8cm / 3in wide and long. Prior to flowering it looks an unremarkable shrub and the beauty of the flowers come as a surprise to many! This shrub does produce seeds very freely and if grown in a weeded flower bed the seeds will often germinate and begin to grow in the spring. These will need to be weeded out although in the UK this is not such a problem compared to other warmer and drier countries. For the first three years it's best to leave this shrub entirely to own devices. 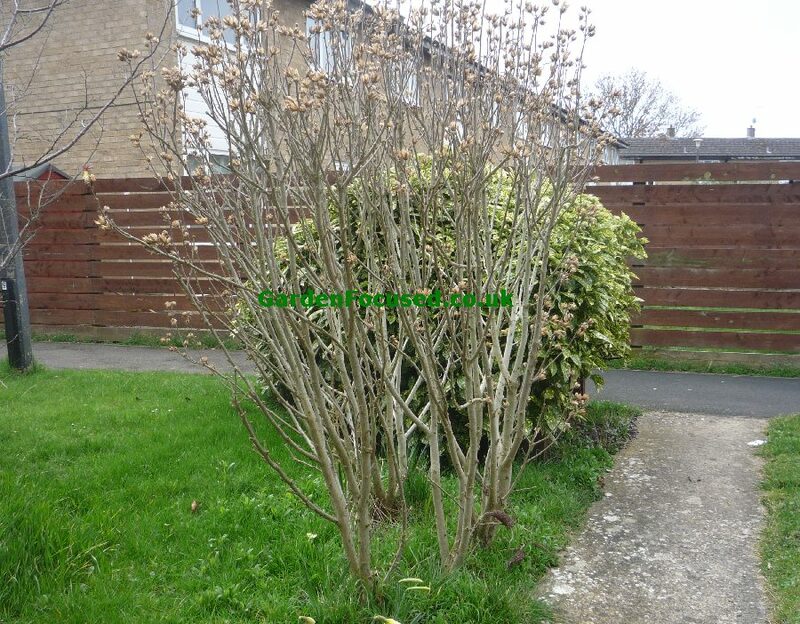 When established and after it has reached a height of about 1.5m / 5ft prune it once a year just after the flowers have died off, early September is normally a good time. Pruning is basically restricted to keeping this shrub to the correct size and shape. Flower buds are formed on the current years growth so no particular techniques need to be applied. Some pruning of older branches in the centre will help to keep good air circulation. A single-stem hibiscus syriacus can be grown relatively easily and it looks particularly impressive, certainly unlikely to be found nearby. When fully grown you will have a plant similar in shape to a standard rose but with a larger head. Follow the instructions below and the process will take three to four years if you start with a two or three year old plant. The easiest time perform the steps below is in early spring when the plant structure is clearly visible and not obstructed by leaves. 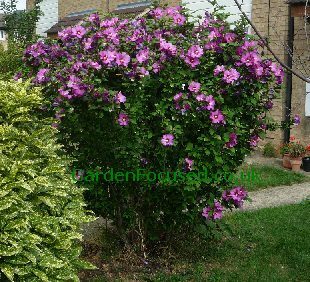 We had a quick look for specialist nurseries which sell standard examples of hibiscus syriacus and found only one, Barcham Tree Specialists. They sell several varieties with clear stems 1.8m / 6ft high - very impressive. Less impressive though are the prices, around £280 for one tree! Choose a strong growing straight stem as near to the centre as possible. Mark this with chalk or similar to indicate this is the stem you want to preserve. Cut all other stems growing from the base of the plant to ground level. This will leave you with one main stem only. On the bottom third of the stem only prune away all side shoots growing from it. Cut the side shoots as close to the stem as possible and use a sharp pair of secateurs. Leave all other side shoots attached to the stem - they will provide some leaves which will enable the shrub to grow. Depending on the eventual size of plant you require, and also how straight you want the stem to grow, it may require staking. Next spring repeat steps 1 to three again. New stems from the base may well appear and these should be pruned to ground level. The main stem will have grown in height and pruning side shoots from the bottom third of the stem will again be needed. The side branches at the top will provide the main bulk of the tree later on so these should be lightly pruned to remove and stems which are not growing upwards. Prune by half any side shoots which have grown below the top side branches. Repeat the above process each early spring until your shrub has reached the required height. You should now have a single stemmed shrub with a clearly defined "head". Choose four strong growing stems in the head and prune away the other stems. Remove all side shoots from below the head. In following years remove any stems which grow from the base and any side shoots which sprout below the head from the stem. Over the last fifty years or so plant breeding has resulted in many different varieties of hibiscus syriacus, the major differences being in the flower colours and form. Which you prefer is purely a matter of personal preference. All the varieties below have been awarded an RHS AGM. This variety produces blue-violet flowers about 8cm /3in wide with a darker central portion. The stamens are well -formed and bright white. One of our favourites and a very popular variety. The flowers are up to 10cm / 4in, pure white with a deep red centre. A traditionally coloured flower of deep pink and a darker centre. The central stamen is a very prominent white. Impressive double lilac-white flowers with a white stamen. Looks quite different from the traditional flower colour and shape. Other "easy-care" shrubs in this series include Choisya, Hebes, Mock Orange, Lilacs, Potentilla and Skimmia. Below we list the key strengths and weaknesses of Hibiscus Syriacus.